The Italian-born, up-and-coming cooking show celebrity brings his passion for Tuscan food to the American table. This beautifully photographed cookbook is alive with vibrant, soul-satisfying food! Growing up in Lucca, Italy, chef Damiano Carrara learned how to cook, not only from his mother and grandmother, but also from his father. Here, he brings those dishes from his family’s table to yours—including his father’s tried-and-true recipe for homemade gnocci with pesto. His comforting, delicious recipes range from Pasta e Fagioli (Pasta and Bean Soup) and Insalata di Farro con Gamberi (Farro Salad with Shrimp) to Finocchi Gratinati (Fennel au Gratin), Lasagne Vegetariana ai Carciofini (Vegetarian Baby Artichoke Lasagna), and Panna Cotta scattered with fresh berries or shaved dark chocolate. This is authentic Italian home-style cooking at its best. Growing up in the Tuscan town of Lucca, Italy, Chef Damiano Carrara developed an interest in hospitality and the culinary arts. He entered the industry as a bartender and trained professionally for bartending competitions around the world, winning multiple awards, prizes, and accolades for his skills. Carrara moved to the US in 2008, where he continued working in restaurants as a bartender, and then as a manager. After five years of hard work, Carrara and his brother decided to open a café of their own in the Los Angeles area: Carrara Pastries (there are now several locations). After gaining popularity and wide recognition in the kitchen, he shared his talents with a national audience as a competitor and judge on several major TV cooking shows. 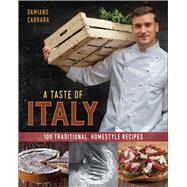 Chef Carrara lives in the Los Angeles area.